"Little War" is what the title means in German. That was the sort of war fought during sieges, small actions taken frequently against the enemy, usually between the walls and the countervallation. You're a sentry standing guard. What does the darkness hold? Click here to "turn on the lights." Doubleclick that link to return to blissful ignorance. Methods and means of investing the fort, digging trenches and advancing the siege have been the focus in our discussion. Nevertheless, throughout all these stages, often right up to the final assaults on the walls, there were frequent little flashes and flareups of fighting: reconnaissance done, forays made, counterattacks mounted, etc. The besieged struck at the trenching and their sappers as well as ranging farther afield in the search for supplies; the besiegers probed for weaknesses, harried the outerworks and helped guard their sappers. And should a little group from one side encounter a little group from the other, there was a fight right there. Much kleine krieg took place at night. Darkeness abetted surprise. And deep into the night, those to be attacked were seduced by desire to sleep, leaving them vulnerable. Not only did kleine krieg involve small numbers of soldiers, but they had to move swiftly, to dart in and out. Fighting was often close and engagements brief. Considering also their supply sources were usually near at hand, these men took with them into the night only the appropriate weapons for the mission. Kleine krieg occurred outside siege situations, too, likely much more than historians have written down. For example, two enemy garrisons close by each other sought to weaken the other by frequent skirmishes and ambushes, and raids to seize supplies or destroy resources for their enemy, all the time eroding the livelihoods of civilians in their vicinities. Such staccato grinding away on the small scale seemed to have influenced the outcomes of wars more than great battles such as Lützen (the Thirty Years War blazed on another 16 years) and Nieuwpoort (the Eighty Years War burned along for another 48 years with only one intermission). 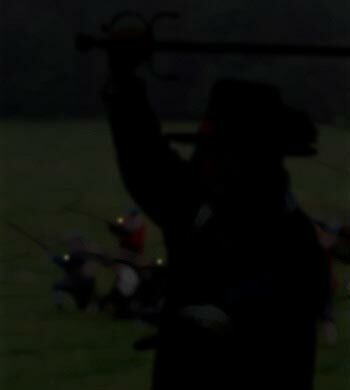 Small numbers and fluid action of the raid or foray favored the musketeer over the pikeman (although it was a challenge for musketeers to remain concealed by the night when their bandoliers rattled and their matches glowed). As with pikemen, heavy cavalry became superfluous in kleine krieg; in 1572 the Duke of Alva got rid of his heavy cavalry. But light cavalry and dragoons proved very useful; in the latter part of the Thirty Years War, mounted soldiers outnumbered those on foot in most armies. In addition to enemy forays, sappers had another worry, one that struck in the light of day - and could strike and strike and strike. That was artillery fire. Silencing those cannon would have been the first order of business. Cannon struck back at cannon.